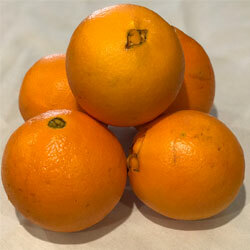 Navel California navel oranges are considered by many to be the best oranges in the world for eating out of hand. They have a meaty flesh, their thick rinds are easy to peel, the segments separate easily, and they have no seeds. All navel oranges have a navel at the blossom end – an opening with a convoluted interior that looks like a navel. Some have a very small navel; others have a larger one.